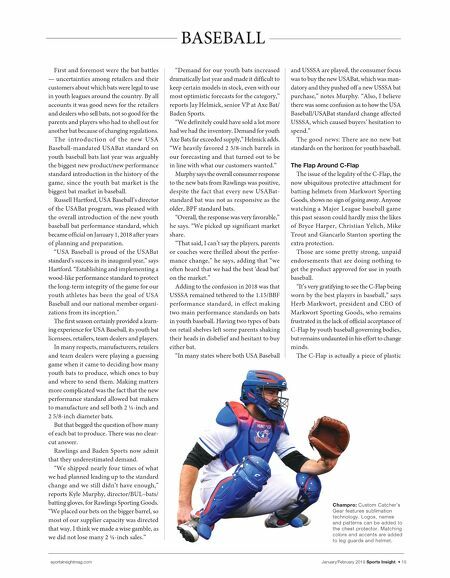 14 • Sports Insight January/February 2019 sportsinsightmag.com BASEBALL Up to Bat W hile Major League Baseball may be baseball's marquee vehicle, the lifeblood of the game remains at the youth level and, well, maybe a little older. From five-year-old T-ballers who play at local public parks to the 70-plus year-olds who gather every November to play in events such as the Roy Hobbs World Series in Florida, baseball retains its hold as the National Pastime because it can be played at so many different levels. And, of course, it is just over 18 months until baseball (and softball) return to the Olympics in Japan in 2020 The leadership of USA Baseball and the athletes who will represent Team USA are fired up about the pursuit of Olympic gold. "It has been a global effort to have baseball and softball reinstated for the 2020 Olympic Games in Tokyo," says Paul Seiler, executive director of USA Baseball. "We look forward to showcasing to the world what we feel is the greatest game on earth." Global growth and exposure may be good for the game, but America's retailers take a decidedly more local approach to America's Pastime. 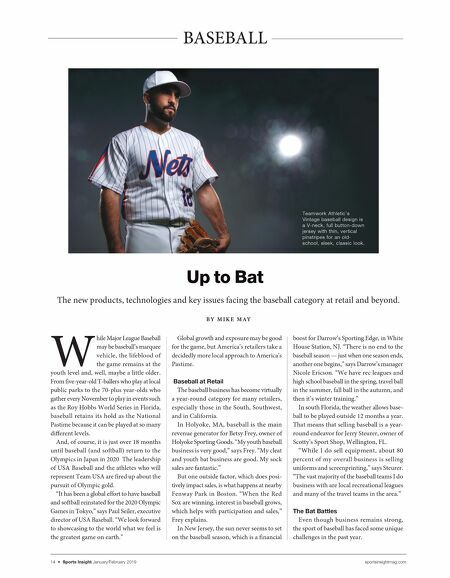 Baseball at Retail The baseball business has become virtually a year-round category for many retailers, especially those in the South, Southwest, and in California. In Holyoke, MA, baseball is the main revenue generator for Betsy Frey, owner of Holyoke Sporting Goods. "My youth baseball business is very good," says Frey. "My cleat and youth bat business are good. My sock sales are fantastic." But one outside factor, which does posi- tively impact sales, is what happens at nearby Fenway Park in Boston. "When the Red Sox are winning, interest in baseball grows, which helps with participation and sales," Frey explains. In New Jersey, the sun never seems to set on the baseball season, which is a financial boost for Darrow's Sporting Edge, in White House Station, NJ. "There is no end to the baseball season — just when one season ends, another one begins," says Darrow's manager Nicole Ericson. "We have rec leagues and high school baseball in the spring, travel ball in the summer, fall ball in the autumn, and then it's winter training." In south Florida, the weather allows base- ball to be played outside 12 months a year. That means that selling baseball is a year- round endeavor for Jerry Steurer, owner of Scotty's Sport Shop, Wellington, FL. "While I do sell equipment, about 80 percent of my overall business is selling uniforms and screenprinting," says Steurer. "The vast majority of the baseball teams I do business with are local recreational leagues and many of the travel teams in the area." The Bat Battles Even though business remains strong, the sport of baseball has faced some unique challenges in the past year. B Y M I K E M A Y The new products, technologies and key issues facing the baseball category at retail and beyond. Teamwork Athletic's Vintage baseball design is a V-neck, full button-down jersey with thin, vertical pinstripes for an old- school, sleek, classic look.